I’ll soon have you feeling fabulous!!! The minute I walk through your front door my only aim is to make you feel fabulous! One thing I’ve learnt from this job is that almost EVERYONE has insecurities about their bodies and the first thing most of us do is point out all the bits we don’t like. Well let me tell you once you enter my tanning tent I won’t allow any such talk. We are all beautiful and fabulous in our own way. Ill soon have you forgetting you are standing there with next to nothing on with my friendly, bubbly, chatty (Oh yes I CAN chat lol) and Professional personality. Most common feedback is how at ease and comfortable I make you feel. I’ve also been known to do a little ‘shake it off’ dance (channelling Taylor Swift) and sing along (maybe I need my own tanning soundtrack??). I’m always on hand to give prep advice and guidance before, during and after the tan. My fabulous clients often comment that they feel like they have known me for years! So….whether you’ve never had a spray tan, or you had one years ago and ended up orange, you’ve tried every tan on the market, you always usually go to salons (“Why did I ever do that now I’ve found you”) trust in the word on the street and the massive vibe about Wilde About Tan and give us a call. I promise you won’t regret it. 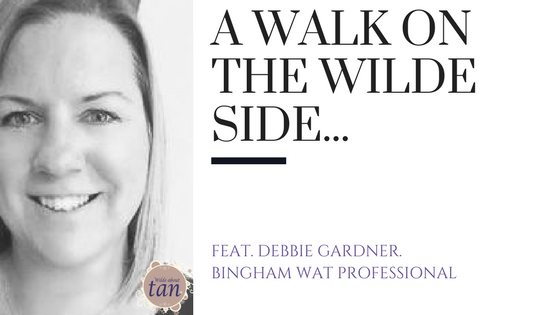 If you are in the Bingham area or know someone who would love a WAT tanning experience with the fabulous (legendary five star) Debbie, you can book with her directly here!